* 1/2 cup Brazil or Walnuts nuts, soaked in water for 2 hours, then drained. * 2 tablespoons coconut oil. * 1/4 cup raw cacao powder. * 2 teaspoons sugar free maple syrup . * 1/4 teaspoon sea salt. * 1 1/2 cup walnuts or cashews, soaked in water for 2 hours, then drained. * 1/4 cup chocolate WPI or casein. * 1/3 cup coconut oil, melted. * 2 tablespoons sugar free maple syrup. * 1/4 teaspoon sea alt. 1. Line a small baking dish with baking paper. 2. Place the ingredients for the base of the raw fudge into a food processor and blitz until combined. Press this mixture firmly into the baking dish. Place in the freezer while making the topping. 3. To make the topping process all ingredients together in a food processor. Remove base from the freezer and scoop over the topping mixture. Spread evenly across the base with the back of a spoon. 4. 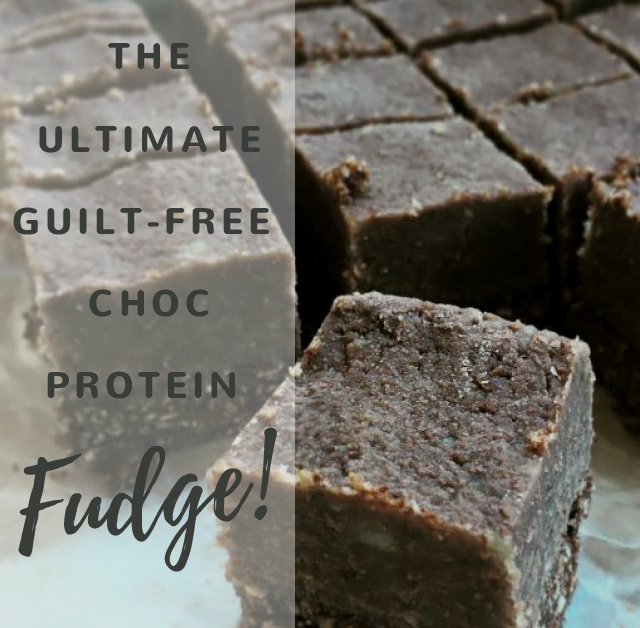 Place fudge back into the freezer and allow to set for 30 minutes. After this time, remove and slice into 12 or more pieces.